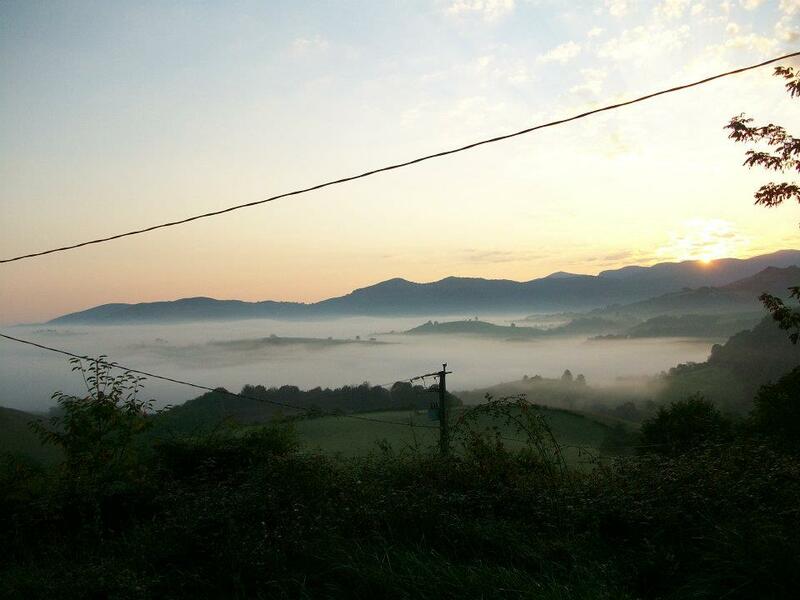 The Camino de Santiago was my first ever solo travel adventure. And while I had traveled widely with my family growing up, this was the trip that gave me the motivation to keep doing it on my own. 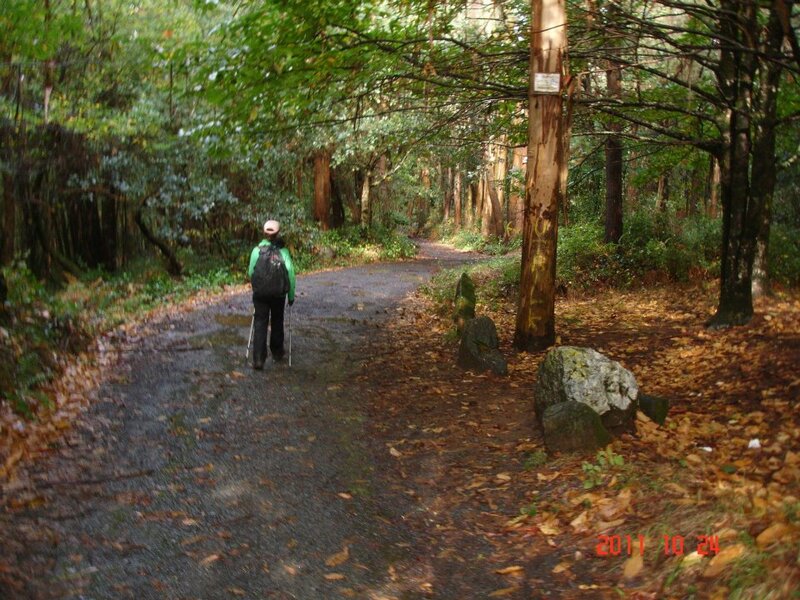 The lessons I learned on this trail were invaluable, and I often daydream of a second pilgrimage. 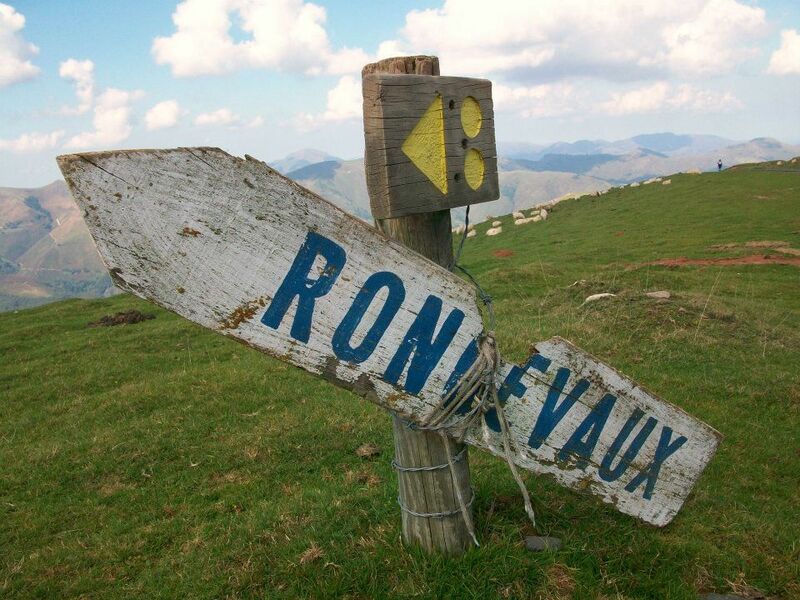 St Jean Pied de Port, France; Roncesvalles, Zubiri, Pamplona, Obanos, Villatuerta, Estella, San Sebastian, Los Arcos, Viana, Navarette, Azura, Granon, Tosantos, Burgos, Leon, Mazarife, Santibanez, Astorga, Murias de Rechivaldo, Foncebadon, Molinaseca, Ponferrada, Pieros, Vega de Valcarce, Palas de Rei, Arzua, A Rua, Santiago de Compestela, Madrid, Toledo, Avila, and Segovia, Spain. I don’t have any pictures of La Casa Magica in the town of Villatuerta, Navarre. But it really stands out in my mind as – yes – a very magical place. Perhaps it was that I was in a state of exhaustion when I arrived. Maybe it was the loving kitty that plopped into my lap as soon as I put my bag down. Or it could have been that the owner personally iced my feet and ankles upon noticing my sad limp. Either way, I found the crumbling courtyard to be incredibly charming and the facilities to be spotless. The pilgrims in La Casa Magica made our own dinner the night of our stay, but we were offered fresh veggies and local wine to add to our meal. 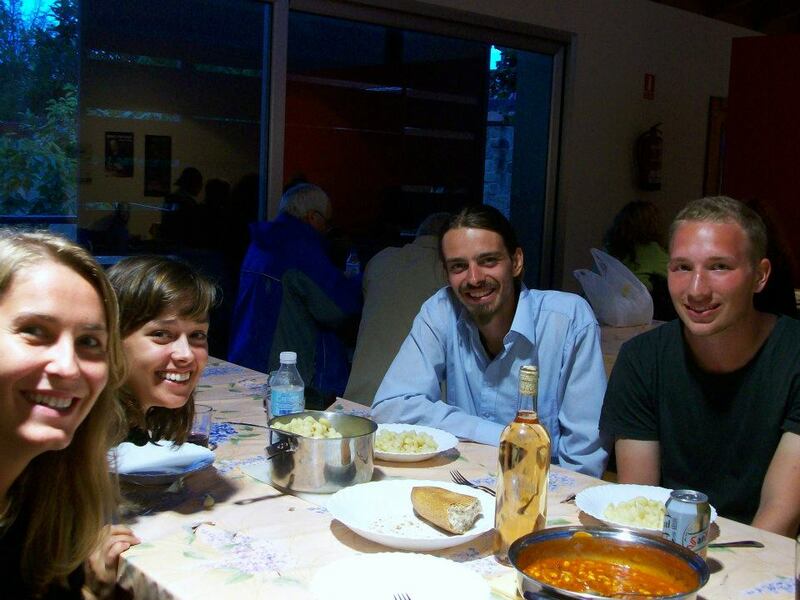 That night is one of my favorite memories of The Camino. 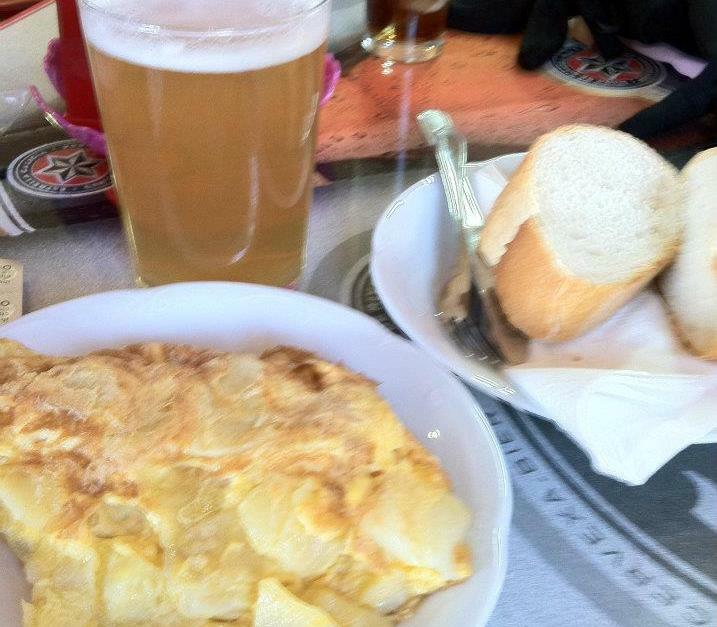 My favorite lunch while walking, this hearty egg and potato omelet is typical of Spain and can be served hot or cold depending on your preference. Washing it down with a pilsner mixed with a lemon-lime soda (it sounds weird, but I promise it’s so refreshing!) = amazing. It was delicious, and often served on or with a sizable portion of bread, it was full of the calories and nutrients I needed to stomp out another ten kilometers. I wound up taking an unexpected detour to rest my tendinitis-stricken feet with family friends in their hometown of San Sebastian. Visiting the city hadn’t been on my original itinerary, but I’m so glad this accident happened. Isn’t touring cobblestone streets on the back of a scooter exactly the European experience every American girl dreams of? 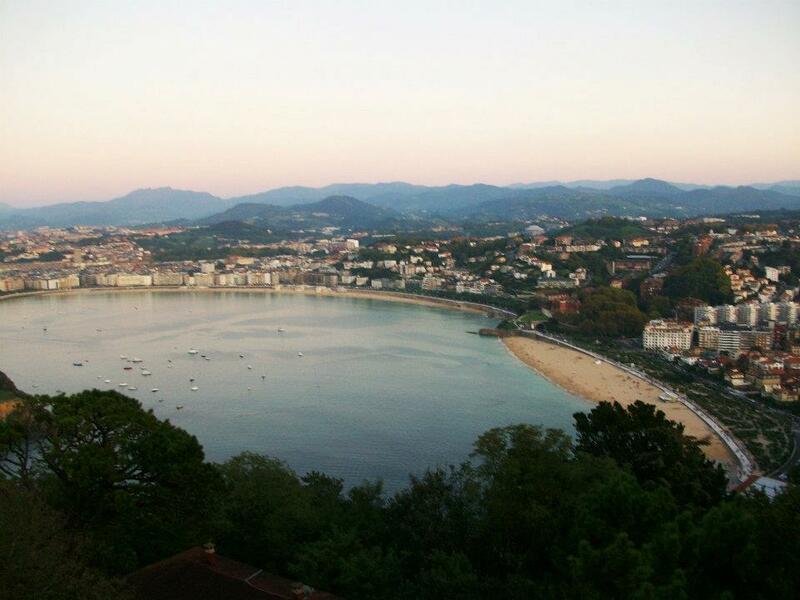 San Sebastian is, without a doubt, the most beautiful city I’ve ever visited, and perhaps my favorite in all of Europe. 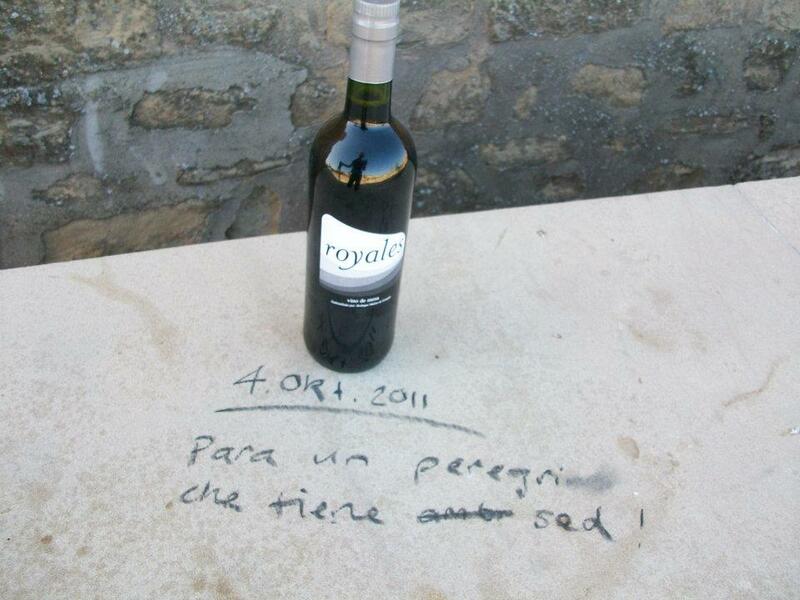 Hiking through the wine growing region of La Rioja during the harvest was a delicious, delightful experience. I was offered grapes straight from the vines by workers as I traveled through their fields, and every meal was accompanied by wonderful (and cheap!) local wines. My only complaint about La Rioja? It was way too small! I could have wandered those vineyards for weeks, but alas, it only took me a few days. My biggest fear for this trip came true only a week into my walk, when I hobbled into a Doctor’s office in Estella and was told I had a horrible case of tendinitis. He told me right then and there that I should take the bus to Santiago. While I did have to hop a few buses to finish the trail on time, I was able to walk the majority of The Way in the end – but not without a tremendous amount of patience. Like many 22-year-olds, patience was not something I had in abundance, and there were several days where I ignored the signs my body were sending and overdid it. The injury forced me to take the walk, literally, one step at a time. And while I felt very weak in the moment, I know now that I am much, much stronger for it. I found that friendships forged fast on the Camino, and it was really hard sometimes to stay behind while other pilgrims I had grown close to continued on. But my tendinitis required time, and I found myself needing a rest day on three or four different occasions. It was hard to say goodbye to my new-found families, but I knew staying behind was the only way I could get to Santiago on foot. And as it turned out, each time I started up again, I gained a new and loving group of fellow peregrinos to limp with along the way. I wish I had written more. I was limited quite a bit as far as what I could upload to this blog due to limited and expensive internet access, but I really wish that when I came home I would have spent some time fleshing out the experience in more detailed posts. I didn’t because I was rightfully exhausted, but truthfully I probably had (and maybe still do) a book in me of stories I could tell and lessons learned on the Camino de Santiago. 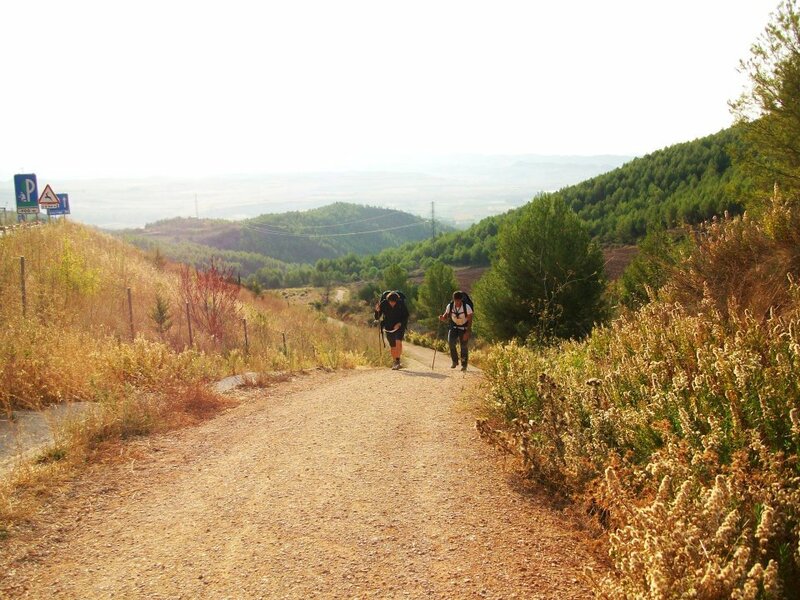 I would love to do the Camino again – this time in its entirety. 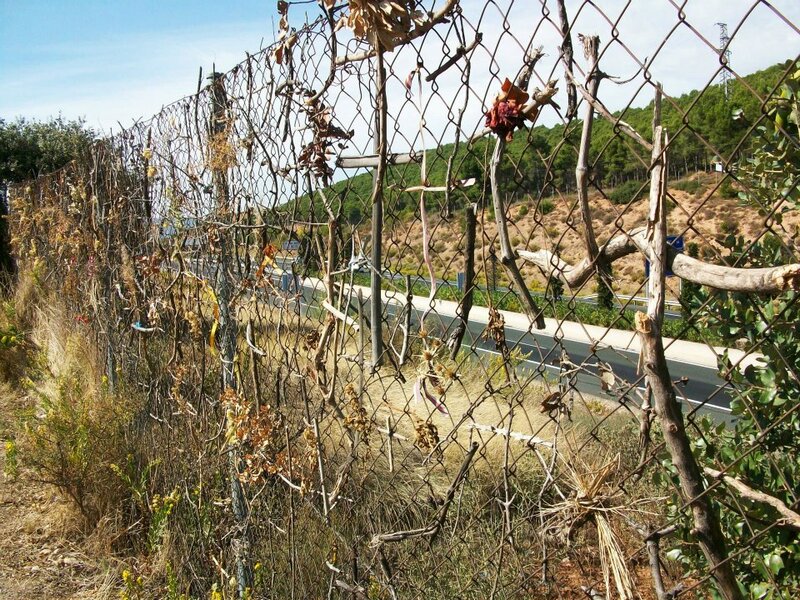 I had to skip a fairly large portion between Burgos and Leon because I only had five weeks in between plane tickets and my injury slowed me down. The next time I head out on the trail I will wear ankle braces from the beginning, and slow down quite a bit. I’d like to spend more time in some of the bigger cities along the way and so I think next time I’ll give myself at least two months to do the entire thing. 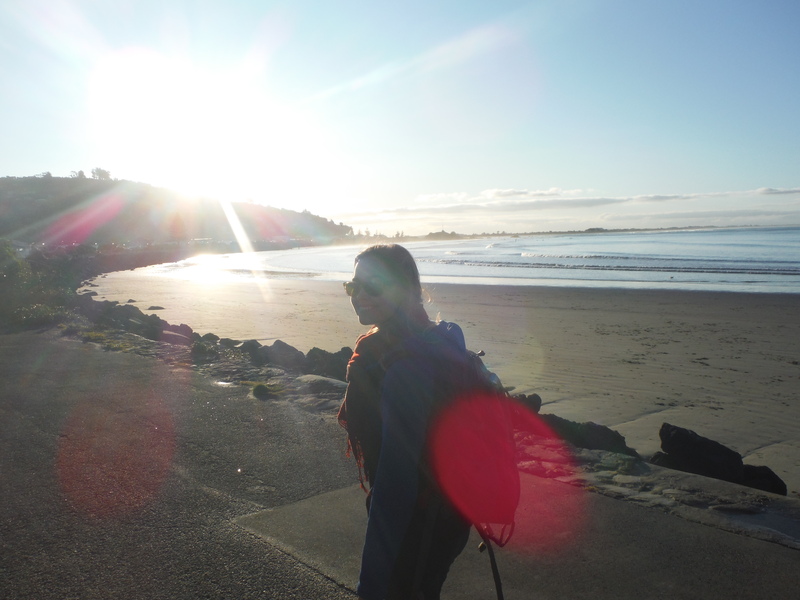 How does one conclude an experience that was life-changing and eye-opening in so many ways? You don’t. You can’t. Once a pilgrim, always a pilgrim. 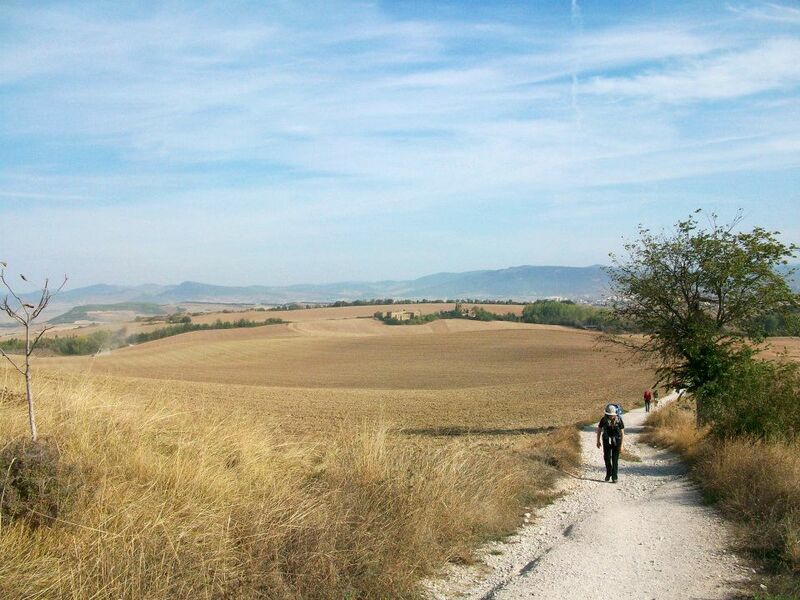 The biggest lesson I learned on the Camino: don’t stop walking. And I haven’t. Next Is Flying Economy Comfort Really Worth It? You know, The Alchemist is my favorite book and I never knew Paulo Coelho wrote about the Camino! I will have to read it! “Don’t stop walking.” I love that. Thanks for sharing your experience. Thanks for sharing this, I’m going in September and am getting really scared about potential injuries, the fact that I might hate it entirely walking all day, that I won’t be able to make friends there, that I’ll get bed bugs… all sorts of things. It’s always good to hear people who say that it truly is a good experience. I am so jealous of/excited for you! I started in September and I found the fall to be the perfect time of year for walking. I will tell you that I did get injured AND bedbugs, and there were days were the walking was monotonous or I worried about being alone – but you know what? None of it was a big deal! I got tendinitis, so I just walked slower. I got eaten by bedbugs, so I washed all my things (and looked a bit funny, but you don’t walk for weeks and expect to look good). Sometimes I got bored, but I just kept walking. And sometimes I was lonely, but never for long. You will learn to just go with it, and it will be good!